We were enthusiastically endorsed by the CYO of Los Angeles! From the CYO of Los Angeles website. See link above. Many thanks for liking our film! Rob Weingard has produced an impactful documentary film about the state of youth sports in America. As a successful businessman, Former D1 Athlete, Dad and Coach, Mr, Weingard has witnessed a downward trend in youth sports in his community and across the country. 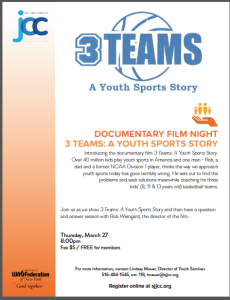 Hey friends, this Thursday night at 8pm we will be presenting a special screening with a Q&A of our film 3 Teams: A Youth Sports Story, at the Roslyn JCC which is a lovely facility on Long Island in the town of Roslyn. See the graphic for details. Producer and Star of the Documentary Rob Weingard will be taking questions from the audience along with some special guests. Website Designed by: Nimo Design Studio February 2014.